It’s always a special day when I can introduce a book written by a friend. 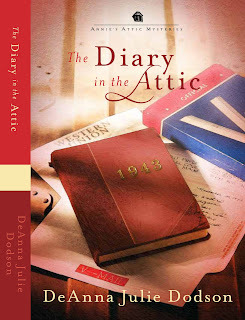 The Diary in the Attic by fellow Inkwell contributor DeAnna Julie Dodson is part of the Annie’s Attic Mystery series. While searching the attic for her grandmother’s Easter-themed table linens, Annie Dawson stumbles upon a box contain a diary (dated 1943) and other World War II memorabilia. Did the young couple in the letters marry or did war end their chance for a happily ever after? Lilly saw Mrs. Lambert standing in the front window, clutching the curtain in one hand and a paper of some kind in the other. She was at the door before Lilly could knock. Sobbing out a broken torrent of German, the older woman pulled Lilly inside and sat down with her on the sofa. She held out the paper in her hand. A telegram. The telegram. Annie Dawson’s discovery of a diary in the attic of Grey Gables, the Victorian-era home she inherited from her grandmother, Betty Holden, has set her on a mission. 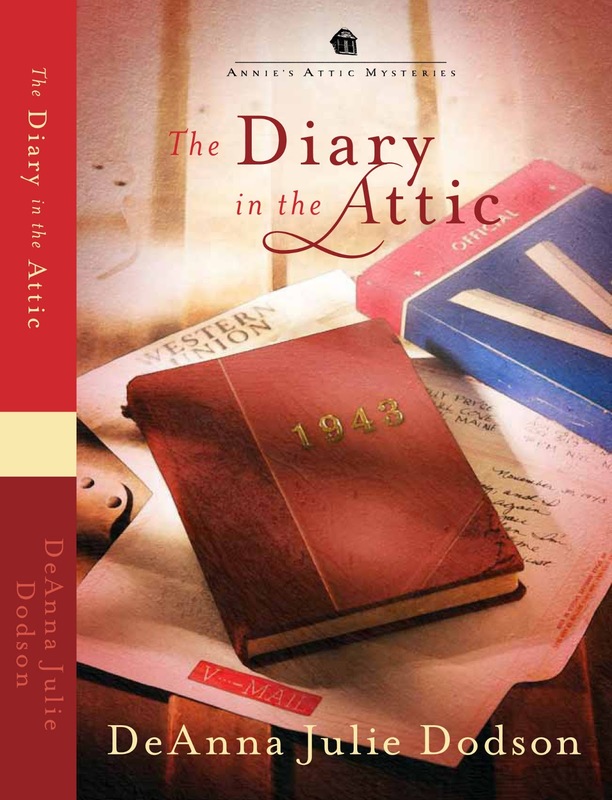 The diary reveals a poignant love story from World War II, a story cut short when young Peter Lambert goes off to the European Theater, leaving his young girlfriend, Lilly Pryce, with a promise: He will come back to her. But that promise is smashed when Peter’s mother receives notice from the War Department that Peter is missing and presumed dead while on a mission behind enemy lines. Lilly’s diary brings into focus Annie’s personal tragedy—and her growing relationship with Ian Butler, Stony Point’s handsome mayor. Did Lilly find a new love after her loss of Peter? She is also intrigued by the discovery of several V-mail letters form Peter to Lilly and several photographs. Annie wonders: Whatever happened to Lilly after Peter’s death? Where is she now? How did such personal belongings end up in her grandmother’s attic. With the help of her best friend, Alice MacFarlane, and the other members of the Hook and Needle Club, Annie sets out to find the answers to this latest mystery. Along the way, they may also find the answer to that age-old dilemma: Can love once lost become love found again? Annie locates the diary’s owner in an assisted living apartment near Stony Point. But what happened to Lilly’s handsome beau? The last available information from the War Department listed him as MIA. Can Annie discover his fate and bring closure to an 87-year-old woman’s remaining time—or will her questions resurrect old wounds and betrayals best left buried in the past? This is a gentle mystery. And while Stony Point bears more than a passing resemblance to Jessica Fletcher’s (Murder, She Wrote) Cabot Cove—right down to the picturesque, Victorian-era coastal Maine town—you won’t find any dead bodies here. If you like cozy mysteries with small town settings, here's a new series for you to check out. Do you like mysteries? Do you have another favorite mystery series (either book or TV) that you think Inkwell readers might want to check out? I'm looking forward to reading this myself, CJ. I think it's great that the crafty folks behind Annie's Attic decided to offer cozy mysteries to their dedicated customers of craft-making items. We've had fun (in the underground Inky headquarters) brainstorming a plot point here or there with DeAnna. I love mysteries and DeAnna's a great writer. Perfect combination. I can't think of any other series that has done what the Annie's Attic series has. But it's a great time to remind readers to watch for two new mystery releases coming out of Inktropolis soon! And thank you, Inkies, for the brainstorming, especially on the next book in the series. You're all the best! Thanks, CJ. I'm really looking forward to reading this one. It just screams nostalgia, doesn't it? Congrats, DeAnna. The whole project has an aura of genteel sophistication. Well done. Deb -- yes, there are more mysteries to come this year. Hmm. I might want to go put myself on the calendar. Never too early to sign up! Anita, well, you know me and history. And yes, Deanna, well done. First off, congratulations on your newest release. We used to have some V-mail at home. (Don't know what became of it.) My mother had a cousin who was MIA and presumed dead in WWII. After the war, he was officially declared dead. He was an only child. I have the set of silver that his parents got for their wedding. I use it at holidays and special occasions. This story really made some of that family history more "real." Thanks, CJ. My dad was born the same year as my character Peter. He was only 17 when he enlisted in the Navy (with his parents' okay). I have a few v-mails and letters his mom kept. It's really cool. What's neat is that v-mail form was one the publisher bought (REAL forms from WWII!). Then he had someone fill it out with the text from one of Peter's letters to Lilly. If you look at the edges of the form you can see under the diary, you can tell it's from his last letter home. Love, love, love! DeAnna is a great writer and soon we'll have her Edwardian mystery to enjoy. I can't wait. Perhaps you've given me a new idea though. Hmmmm . . .
Love that extra touch DeAnna. I have mail from my family during WW1 and WW2. I hope to get it all scanned to save digitally. Congratulations. How many Annie's books have you written, 2 or 3 now? DeAnna, I noticed the diary and the v-mail, but I'm going to have to look more closely at the details. How neat. Suzie, we'll all be fighting for the honor of reviewing DeAnna's new series. @Deb This one is Number Three for me (#25 in the series), but I have one more coming, The Legacy in the Attic (#29 in the series). Love the details about the cover that you shared DeAnna, that is too cool. I have this one sitting next to my chair even now, and I'm itching to get started. Soon. Soon. Soon! Very nice review, CJ. The ladies in my family have been looking forward to this book, and it's quickly getting passed around. These books are so cozy, and perfect for teenagers, grandma...and me. Cool details about the v-mail!